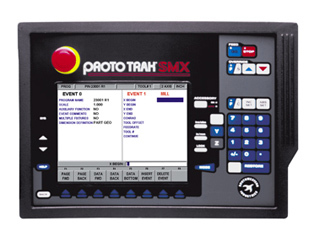 The ProtoTRAK SMX is a powerful CNC for milling machines that lets you choose the capability that is right for you. Even in its simplest and least expensive form, the ProtoTRAK SMX is a powerful CNC for toolroom work. Advanced technology blends with the easy, natural user interface that makes the ProtoTRAK the world’s most popular CNC for small lot milling. If more advanced capability is important to you, the Advanced Features Option has many productive routines such as the popular Auto Geometry Engine™ and Spreadsheet Editing™. These advanced features are presented in the same, easy-to-use format that makes the basic system so useful for toolroom work. Advanced program storage including networking helps you to organize, control and back up program files right from your CNC. Electronic handwheels installed in the table and saddle of the milling machine extend the capabilities of the ProtoTRAK beyond the ordinary. Manual milling is enhanced with powerful GO TO and selectable Fine/Coarse handwheel resolution. CNC milling is revolutionized by the TRAKing feature that gives you manual control over your program run. This option replaces the standard vari-speed head with an inverter-duty head to enable programmable spindle speeds and tapping.